In Italian, oregano is described as condicio sine qua non and we agree: it’s one of that handful of utterly great flavorings. In the U.S., oregano is—or was—best known as the characteristic taste of well-made pizza; we say “or was” because well-made pizza, like well-made anything, is becoming scarcer and scarcer, and blander and blander, so it is not hard to imagine folk who really don’t know the taste of oregano even if they eat a lot of pizza (or what passes for pizza nowadays). In any event, though, oregano has a horde of culinary uses beyond pizza. According to the Herb Society of America, “The genus Origanum consists of over 44 species, 6 subspecies, 3 botanical varieties and 18 naturally occurring hybrids, and includes several types of oregano as well as sweet marjoram (O. majorana) and dittany of Crete (O. dictamnus).” Moreover, “Carvacrol, a creosote-scented phenol, is the signature chemical responsible for the sharp, pungent flavor of the culinary oreganos”—but by no means all Origanum species have much of it, while several quite unrelated other plants do (and are sold in various parts of the world as “oregano”). As you begin to see, this is very, very tricky business. Hard as it is to believe, for example, there are apparently sources selling pot marjoram (a wildly inferior cousin) as true oregano. But even beyond basic errors (or frauds) like that, there are many questions about what “true” oregano is. 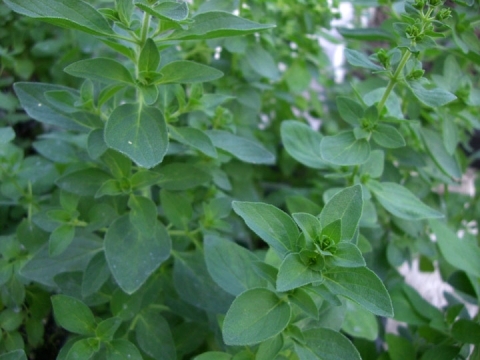 There are, still according to the Herb Society, about eight true Origanum species regularly used as culinary “oregano”. The Origanum species of prime interest is usually called “Greek”; that term can, though, include many kinds. What the real oregano fancier will want is what is often listed as Origanum heracleoticum, though also sometimes as Originum vulgare hirtum. As you see, in the scientific name as we gave it way above, the hirtum distinguishes “true Greek” oregano from more ordinary kinds, though the appellation O. heracleoticum seems more reliable as an indicator (see how messy this is?). While we’re doing this, let’s tick down a few other oregano types that can confuse the seeker after oregano flavor. The “oregano” often referred to as “Italian oregano”, when we brush aside the seedsmen’s puffery, turns out to be Origanum x majoricum, which is to say a cross between true oregano and pot marjoram. Naturally, it is puffed as “milder” and “sweeter” oregano, whereas it is just—as we see it—watered down oregano. Another type, labelled as “Greek” and called Kaliteri (which, as the seedsmen invariably remind one, is Greek for “the best”) is apparently O. onites, which the Herb Society says is “Turkish oregano/rigani”; curiously, an expert herbalist lists O. rigani as “Greek oregano”, and adds that “In the past, this oregano was often referred to as Pot Marjoram.” Well, well. In other words, it’s just another watered-down oregano. And finally, anything from a nation south of the U.S. that is called “oregano” is almost surely not even an Origanum species at all, which is not to say that all such stuff is awful—most such plants have some of the same flavoring oil as dominates oregano—but oregano it is not. In sum, what one wants is “true Greek oregano” with a definite species label of either Origanum heracleoticum (preferable because most certain) or Originum vulgare hirtum, bought as plants (not seeds). The end. Oregano is notoriously highly variable when grown from seed, so purchase of a plant from a reliable herb and spice specialist house is almost mandatory, with an emphasis on the “reliable” part (even the seedsmen get sent false varieties, and we must rely on them to spot those and send us only wnat we really have ordered). Oregano is not at all fussy about soil conditions, save the usual requirement that it be well-drained. It has reportedly a slight preference for lightly alkaline soils, but few worry much about that. As with most herbs, average to poor soils produce the most concentrated flavors. Water sparingly, as with most herbs. To maintain its vigor, it is wise to divide the plant every few years; autumn or spring are the best times for division. This is another herb set back by cooking, and so best added to any dish just shortly before serving it, or even at table (good pizza places put a jar of it on their tables next to the pepper-flakes jar). It was last modified on Monday, 4 February 2019, at 16:00 EST.